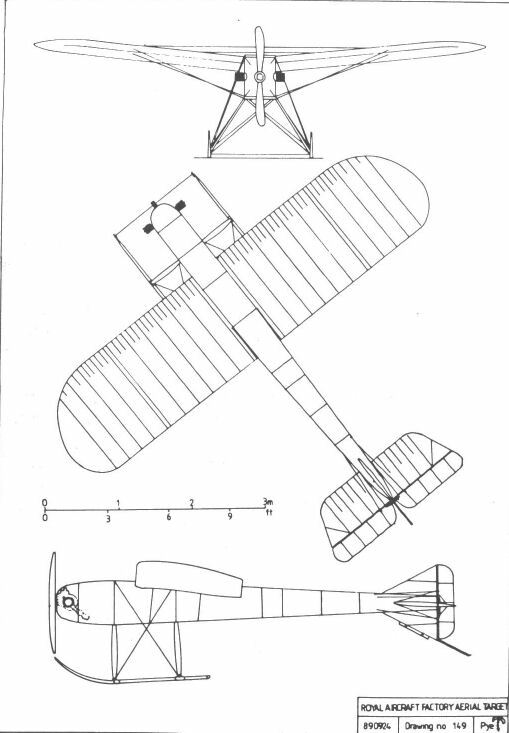 Gary Warne has a remarkable post, ‘The Predator’s ancestors: UAVs in the Great War’, in which he describes Captain Archibald Low’s Aerial Target project. 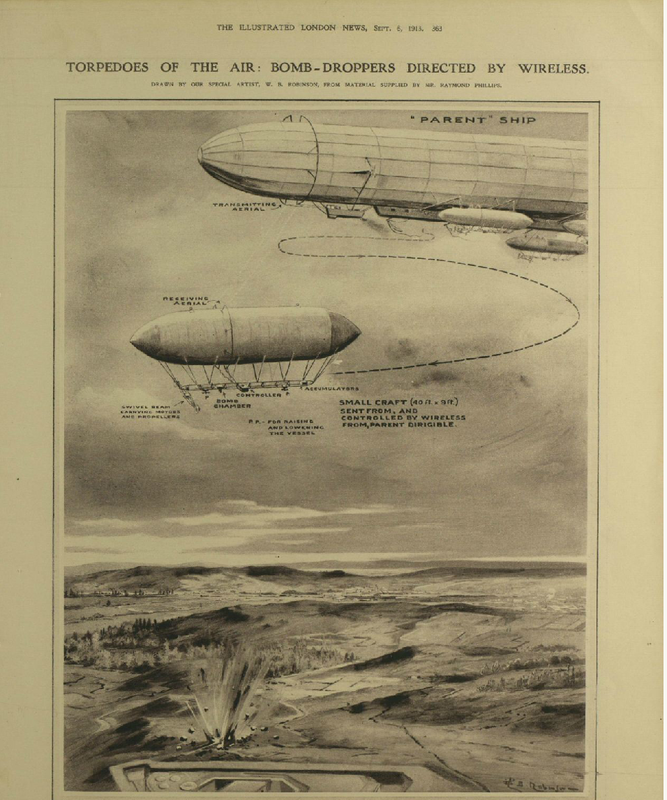 The codename was a deliberate distraction, Warne explains, because the plan was to develop a pilotless aircraft as a flying bomb, guided by wireless from an accompanying manned aircraft to attack Zeppelins and ground targets. 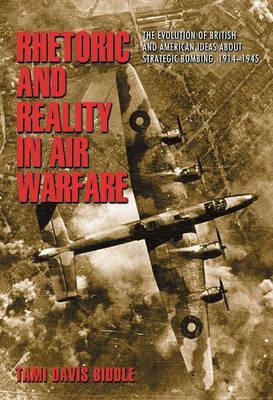 The fullest discussion of Low’s work that I’ve been able to find is by Paul Hare here; some of the back-story is provided by Hugh Driver in The birth of military aviation 1903-1914 (Boydell and Brewer, 1997) and there’s a wider historical discussion in Chapter 2 of Denis Larm‘s thesis here. 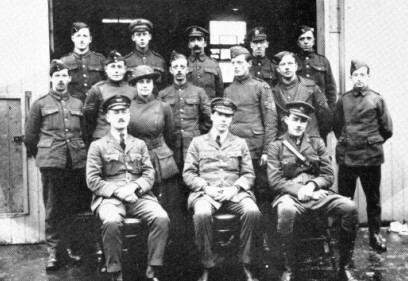 When the war started ‘Professor’ Low, as he styled himself, was already at work on artillery range-finding and, newly commissioned, was soon at the forefront of the Royal Flying Corps’s Experimental Works (below; Low is in the centre of the front row), supervising a team of 30, including jewellers, carpenters and engineers first at a Chiswick garage and later at Brooklands. The noise of the aircraft engine interfered with the wireless transmissions, and the first demonstration flight of the Aerial Target was a disaster. According to Steven Shaker and Alan Wise in War without Men: robots on the future battlefield (Pergamon-Brassey, 1988), ‘during a test flight for a gathering of important Allied dignitaries, the AT went astray and dove upon the guests, who scattered in every direction.’ All together six prototypes were constructed in 1917, but none of them saw combat. Given the first city on his list it’s scarcely surprising that there should have been questions about navigation. Asked how he would know that his airship was over ‘the town you purpose to destroy’, Phillips replied that he might work with a large-scale map or a ‘telephotographic lens’. ‘I think it will do away altogether with existing methods of warfare,’ he predicted. Much more here (scroll down). But one of his rivals in the audience had spotted a weakness in the system. 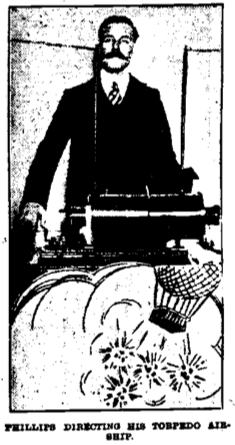 ‘I believe that it would be possible for another operator to interfere with Mr Raymond Phillips’ control,’ speculated Harry Grindell Matthews, using what one newspaper called ‘hostile electric currents’, and he predicted that he could, ‘by manipulating an instrument of my own, compel it [the airship] to turn round and return to the place from which it was sent.’ The two men agreed to a duel between their devices, but I’ve been unable to find any record of the outcome – though the spectre that Matthews raised remains a concern for today’s remotely piloted operations. 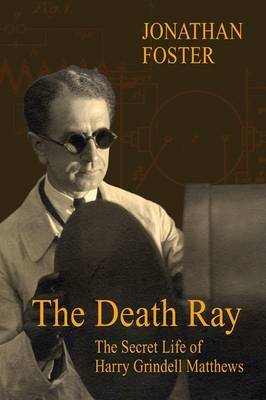 Incidentally, Matthews would later claim to have invented a ‘death ray’…. More on him here and here. The theatricalization of these early projects, with Phillips’s airship nosing its way around the Hippodrome – which was originally designed as a circus and had only been remodelled the previous year – and releasing its load of paper birds forty feet above the stalls, is all of a piece with the ‘bombing competitions‘ and the air displays of the pre-war years. ‘There is no accounting for popular taste in the matter of public entertainment, but we must confess one could scarcely expect to witness the spectacle of a fairly big model dirigible sailing about the auditorium of the London Hippodrome, where at the moment it constitutes one of the star turns…. Yet another instance of the theatre of war. This entry was posted in bombing, drones, visuality, World War I and tagged Archibald Low, Harry Grindell Matthews, Thomas Raymond Phillips by Derek Gregory. Bookmark the permalink.